Charred Necklace incorporates several key issues central to Watson’s work: cultural and historical references, particularly in regard to indigenous women and in the context of her own personal narrative; the body and the use of the arched shape, here as an iron brand. 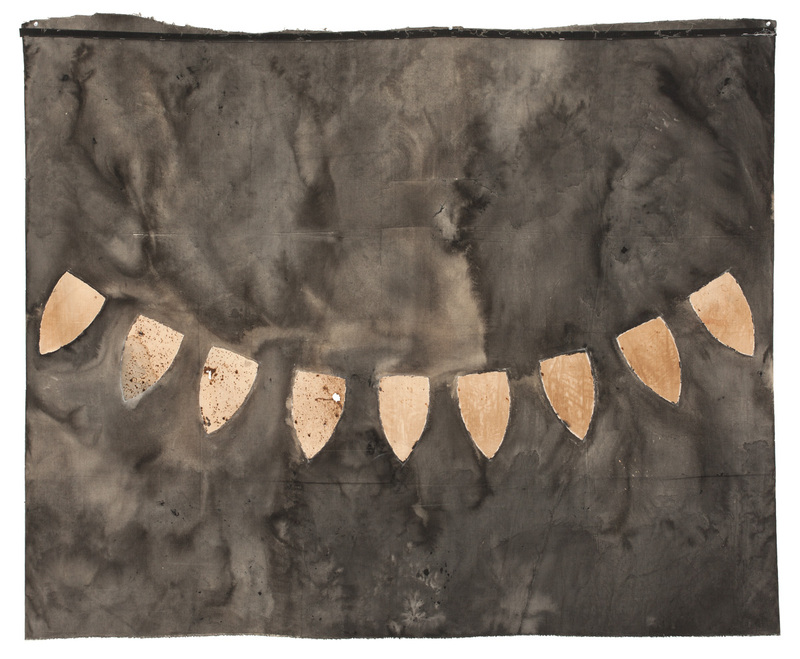 She is experimental with her materials, allowing an organic development to shape the nal image, with the canvas as natural cloth, tapping into her environmental interests. Watson draws inspiration from her connection to her grandmother’s country, Waanyi with a dynamic juxtaposition between the past and the present. Watson is a painter, print-maker, sculptor, installation artist and teacher who has exhibited widely in Australia and internationally. She represented Australia at the Venice Biennale in 1997 and has attained numerous art awards. Her public art commissions include Musee du Quai Branly, Paris and Wurreka the 50 metre etched zinc entrance wall at Bunjilaka, Melbourne Museum.